It’s no secret that liquid lipsticks have taken over the beauty world over the past year or so, and ColourPop, an affordable, quality makeup brand, came out with their own line of liquid lipsticks. I’m definitely a ColourPop lover and have joined the #colourpopcult because they make such great products with unique formulas, and have a variety of products and colors. I’m a little late to the ColourPop Ultra Matte Lip love fest, but I managed to snag a few liquid lippies during their restock earlier this month. Grab some tea or snacks because this review is going to be a long one! 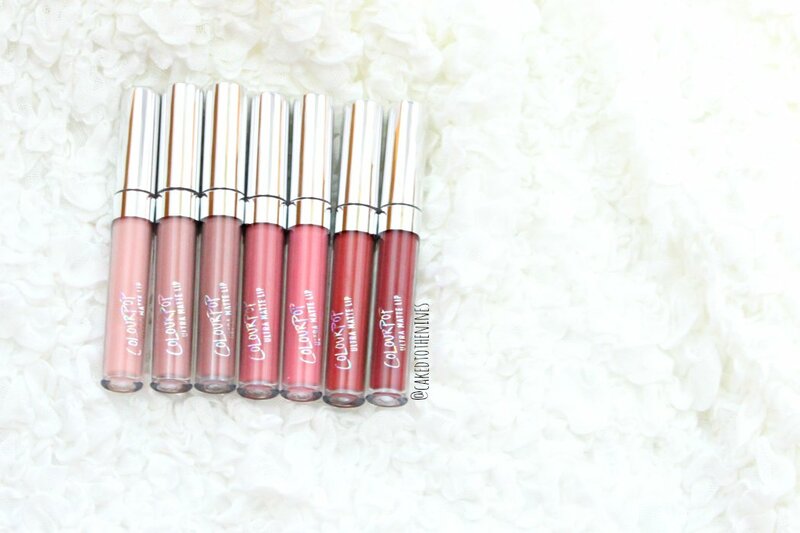 ColourPop Ultra Matte Lip left to right | Vice, Midi, Trap, Solow, Donut, Bumble, and Tulle. These liquid lipsticks are very pigmented and opaque in one swipe, which I’m a fan of. 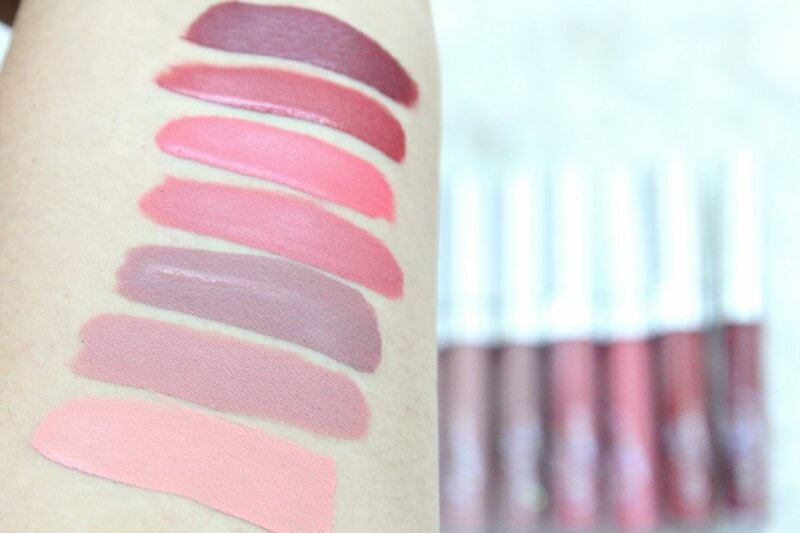 They are true liquid to matte lipsticks in the sense that the formula is very liquidy unlike Stila and Anastasia Beverly Hills liquid lipsticks, which are more creamy with an almost mousse like consistency. Because they’re more liquidy, they dry extremely fast. Since they’re an actual liquid formula, they are pretty drying, but not over the top. If you’re used to liquid lipsticks, I think you’ll be just fine. Just remember to properly exfoliate and moisturize your lips otherwise these won’t be that forgiving. I am not a fan of taking my makeup off; I wish it would remove itself. But, there’s no app for that (yet) so I must do it by myself. As much as I love the feeling of having clean skin after I take my makeup off, I hate having to do it. So, the fact that these come off easily with oil is great. Simply pour some oil– any oil– onto a cotton round, rub it over your lips gently and it’ll break down and come off easily. I’ve heard these are very long wearing and last on some for around 10 hours, but for me they lasted about 6 before fading a bit; they didn’t completely withstand eating and drinking. Keep in mind that since they come off easily with oil, making a salad with oil based dressing (or anything greasy) will likely make the liquid lipstick fade off in the center of your lips, which is what happened to me. That’s how I discovered it comes off easily with oil! An application tip: These can flake a bit if you layer it on too much. If you do layer it, make sure you don’t go overboard otherwise it can clump up. I allowed my first coat to dry completely before applying a second coat and it was still smooth. A quick warning: I’ve heard that these leak out of their tubes so be careful when you close them. I make sure that I don’t have a lot of excess product in the rim of the tube where you pull the wand out. I don’t know why it happens, but the excess product build up in the rim could lead to it leaking out when you screw the cap back on. Since I heard about this little problem before I purchased them, I made sure to carefully remove and insert the wand back into the tube. If I do experience any leakage in the future, I’ll be sure to let you know! If you’re a fan of liquid lipsticks then I think you should check these out, especially since they’re inexpensive. They are pigmented, last a good amount of time (unless you eat anything with oil), have a variety of colors, and dry down really matte. If you’re not a fan of very matte liquid lipsticks and prefer ones that are more moisturizing, such as the Anastasia Beverly Hills ones, which I don’t find as drying due to it’s creamier formula, then you may not like these. These are also runnier in formula so it can get messy if you’re not accustomed to using liquid lipsticks, but that’s not a con that should stop you from trying these! Have you tried the ColourPop Ultra Matte Lip liquid lipsticks? What’s your favorite liquid lipstick brand? Let me know in the comments below!